Before I get into the ‘meat’ of this article let me tell you two things – what I do for a living and what StreamLiner is. It will put the article into context. 1. I deliver small business management consulting services to my clients and train their teams so that they can continuously improve their own business (so that they can deliver higher levels of performance). 2. StreamLiner is a powerful piece of software that can help you to quickly analyze your business processes and develop rapid improvement action plans. Ok, now that’s out of the way let me tell you about one of the common problems I see on my travels. Continuous Improvement takes too much time! Well, it doesn’t take too much time but the people that say this either feel that it does or they are badly organized. StreamLiner helps to reduce the effort required and provides an effective structure for your improvements. When I designed the software with Robert Broughton, we looked at the various tools and techniques I use with my small business management consulting clients. We boiled them down and took the most effective handful and built the software around them. StreamLiner won’t leave you wondering what tool you should use because we have streamlined the process improvement approach. Each tool has built-in templates too, so no more reading web pages and trying to figure out how to fashion your own worksheets – they come built in. At each point in the software, you can convert a concern, or observation, into an action. Actions can be standalone, or as part of an analysis that you have just carried out. The key point and this is a big point, is that you need to capture all of your actions. Not writing actions down is a major failing of a lot of the people that I come across. You have to get in the habit of writing actions down. The next challenge once you have gotten past this is to juggle all of the different action plans. StreamLiner has got your back here, the system can hold all of your plans in one place and help you spend more time managing your team and getting into the improving of the business rather than administrating the process of change! Knowing what to focus on first, to ensure that you get the best results from your efforts, can be a challenge for many of us. Even worse if this gets into a debate with your colleagues this can go round and round in circles – I can’t think of a worse way to spend your energy when you could be improving. StreamLiner has a built-in evaluation system – the BCS score. Using this simple tool you can quickly evaluate your improvement actions in terms of their impact to the business. Combine this with the due date functionality and you have a fast way to produce prioritized improvement plans that will give you the ‘biggest bang for your buck’! One of the frustrations during small business management consulting, many improvement managers report to me when I start to work with them is that they have to spin so many (improvement) plates at once. It can be difficult to keep all of your projects moving when there is so much going on. It is even worse when you realize that the leaders of the business want all of the results today! Using the functionality of StreamLiner you can spin one efficient plate. This means that at any point in time you can manage just one improvement process, not thirty projects of varying sizes. The mental overwhelm of trying to keep every project on track ebbs away and many of my clients have found that they feel better and more in control when they do so. 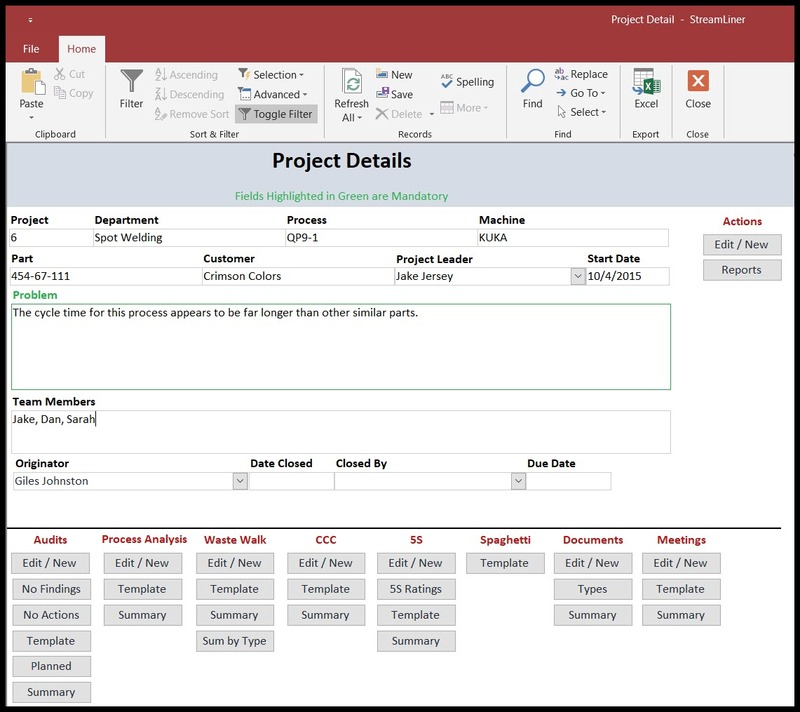 The action centre in StreamLiner allows you to print out and export the project action data with just a couple of mouse clicks. The reports for each of the analyses come out of the software, again, with just a couple of clicks. You will find yourself spending less time administrating and more time getting results when you move your activities over to StreamLiner. If you’re like me and need to demonstrate that you are getting results, while small business management consulting, (whether for an external client, or an internal one) then StreamLiner can really help you to simplify your approach whilst driving up your effectiveness. There are many software tools that you can employ to help you improve your own process of change, but this one is designed specifically for continuous improvement. The top reason I use StreamLiner is that it helps me to produce effective actions plans fast. I have had so many clients ask me how I manage to create an action plan so quickly that is ‘bang on the money’. The reason is that I push everything I see, measure and observe into StreamLiner and press a few buttons.